Charlotte Mayne (Pears) - Employee Relations Manager! Analysis of Paul Watson's Witness Statement (No 34). Latest news, information, Contact Me. The investigation report however is the only place that Mark Atkinson could have gained the prior knowledge he required to make his unbelievable worst case scenario decision. The investigation report however was a character assassination, there was no information ascertaining the behaviour of the warning horn. It begs the question, what made this person tell so many lies? PW: "I thought it would be safe because the warning horn would work". PW: "So can I go through that with you? On number 1, failing to follow the correct procedure, as far as I am aware, the correct procedure and I'm treating it as a PARTIAL FAILURE, is quite simply at the first convenient opportunity inform our control". The following is a three way conversation on the warning horn. It was NOT a conversation on how the warning horn behaved that January morning. MA: "So if you had a horn that was slightly defective, would you say it was controllable in traffic"? MA: "Could you control the situation? If you were the driver and your horn is partially defective, fully defective, is it controllable? Safely? Is that situation controllable in a safe manner"? ST: "Of course its controllable, you obviously restrict your speed appropriately". PW: "Well I classed it as a PARTIAL FAILURE so it doesn't tell me in the TW5 (Rule Book) to do that". MA: "If it was really unsafe, you thought you would have done, wouldn't you"? ST: "Well if you have got a complete failure you, you would be down to 20mph". PW: "I didn't say it was completely unsafe because". MA: "It was still working". PW: "On and off, it is all right you know, they are all like that". SO FROM THE ABOVE TRANSCRIPT I MADE MARK ATKINSON COMPLETELY AWARE THAT I ENCOUNTERED A PARTIAL FAILURE OF THE WARNING HORN. The ruling for a partial failure of the warning horn is as follows. When you read the rule book and the contingency plans you will see that the statements below are complete lie's, a simple cross reference is all that is required. LIE NO 1: “The train remained in service, when it should have been removed”. ﻿LIE NO 2:﻿ “You didn't stop and report it at the controlling signaller”. LIE NO 3: “At no point did you reduce the train speed”. LIE NO 8: “Prior to the hearing I considered the Industry Rule Book”. LIE NO 9: “Prior to the hearing I considered the Company's procedures on defect reporting”. 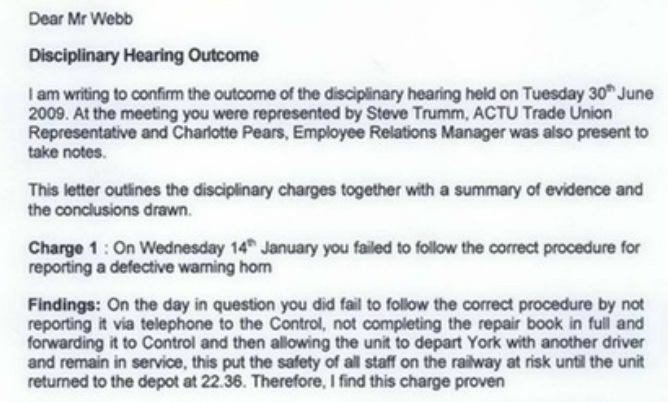 LIE NO 12: “18.5 his actions ensured that the unit remained in public service until it reached the depot”. ﻿LIE NO 18:﻿ "then prior to arriving in York he should have reported the matter immediately and made sure the train did not go any further”. LIE NO 21: “I found that it had been proven that he had failed to follow the correct procedure for reporting a defective warning horn as he had not done so as soon as the matter arose”. LIE NO 22: “and that as a result of this action the train had stayed in service”. THESE LIE'S THEREFORE HOODWINKED JUDGE BURTON INTO BELIEVING THE FOLLOWING TAKEN FROM HIS WRITTEN REASONS. 9. The respondent took the view that Mr Webb had committed a disciplinary offence. He had failed to follow the rule book in relation to stopping his train and reporting the fault in relation to the horn and he had at the very least attempted to make a false statement in relation to this near miss. 11. It seems to us that Mr Webb could have saved the situation if he had acknowledged at that disciplinary hearing that he had failed to comply with that rule, if he had acknowledged the importance of complying with such rules, if he had expressed remorse and if he had demonstrated an intention to comply with such rules in the future. It may have been that the Respondents may have considered a sanction short of dismissal as having been appropriate. 13. He did not express any remorse for having failed to comply with the rule book. He did not express remorse for having told this lie on the defect report sheet. He sought to justify his actions and, as a consequence, Mr Atkinson who dealt with the disciplinary hearing, concluded that dismissal was the only appropriate sanction. 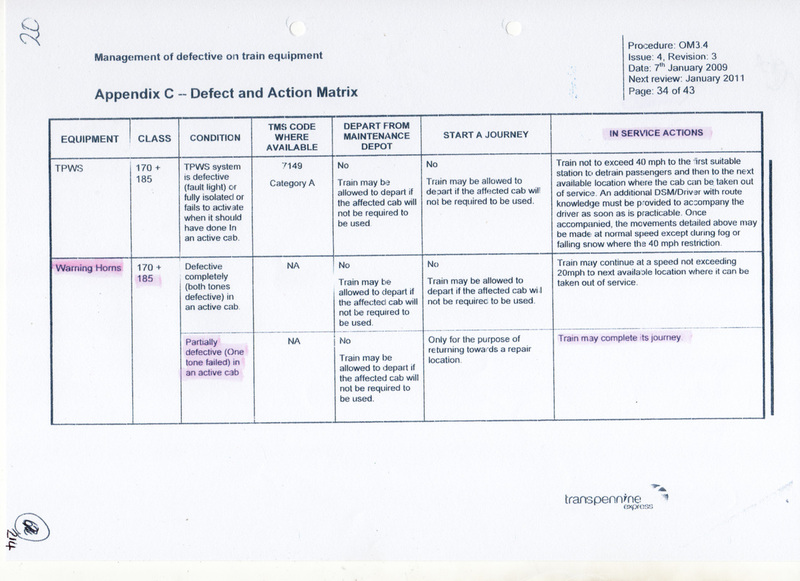 Mark Atkinson was made fully aware that I had a PARTIAL FAILURE of the warning horn, what he wrote in his witness statement and swore under oath was that I had the worst case scenario of a COMPLETE FAILURE which therefore meant a different set of rules applied, Judge Burton with absolutely no railway knowledge believed this and made his judgment on these complete LIE'S. How could I possibly show remorse for failing to comply with a ruling that wasn't relevant to the incident? UTMOST PROOF THAT MARK ATKINSON KNEW I HAD A PARTIAL FAILURE OF THE WARNING HORN COMES FROM HIS FINDINGS CONTAINED IN THE DISCIPLINARY HEARING OUTCOME LETTER AS LAID OUT BELOW. 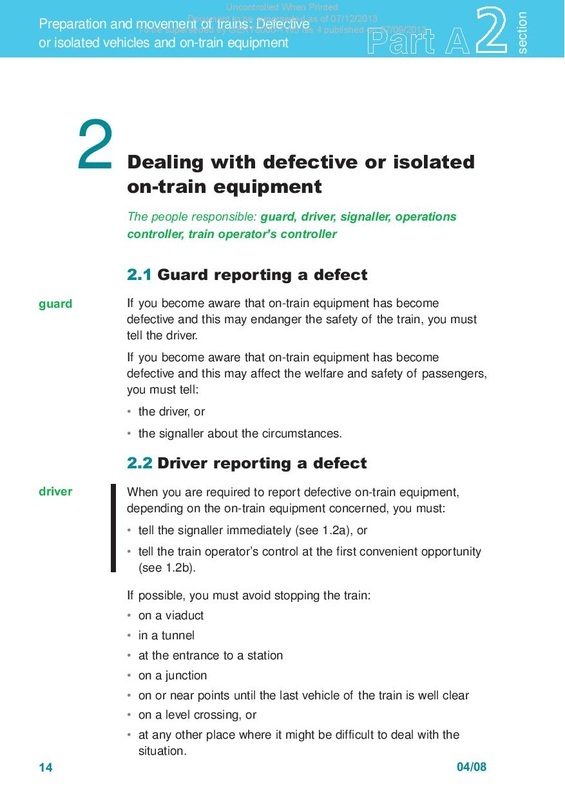 What everyone who works on the railway knows is that even if I was guilty of failing to follow the correct procedure for reporting a PARTIALLY DEFECTIVE warning horn, this is not a gross misconduct offence, this is because if TPE control were informed they would have reverted to their contingency plans which state - "Train may complete its journey". I totally disagree with that ruling, but that was the ruling in place and despite numerous reports on partial and complete failures of the warning horn I was totally wasting my time, I was up against a weapon that is extremely hard to beat - IGNORANCE. 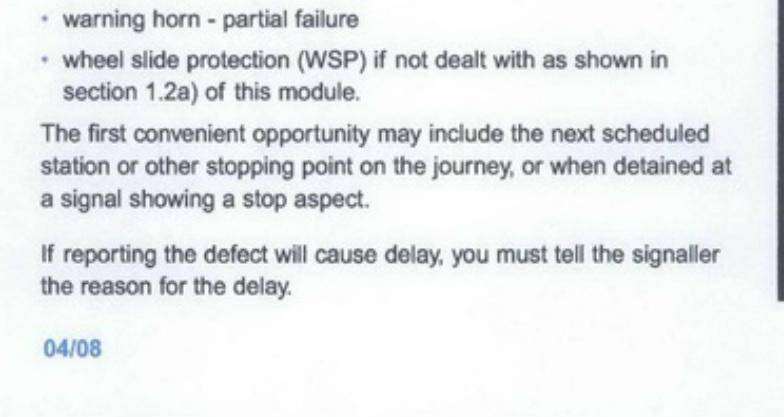 Actually LYING in these findings that I allowed the unit to depart York with another driver and remain in service when he knows full well that the ruling for a partial failure of the warning horn in conjunction with the contingency plans allow that train to remain in service without any restrictions. Also he would know that the cab this train was then being driven from was the other cab on leaving York and as such the ruling would allow that train to leave York even if the cab that wasn't being used had a COMPLETE FAILURE of the warning horn. WHAT YOU ARE SEEING IS THAT MARK ATKINSON MADE THAT MANY LIE'S HE COULDN'T KEEP UP WITH THEM, HE LIED AT EVERY STAGE OF HIS INVOLVEMENT. HIS LIE'S WERE MADE WITH MALICE, THEY WERE PRESENTED IN A WAY THAT MADE ME LOOK A DISGRACE, TO INFLICT MAXIMUM INJURY AND INSULT. Not forgetting in the eyes of EQUITY, I have an abundance of proof that other drivers behaved regarding this ruling the same as me and that TransPennine Express Management allowed trains with a COMPLETE FAILURE of the warning horn to remain in service and re-enter service with this fault and run at speeds up to 100mph! MY PROOF OF THE ABOVE IS IN THE SECTIONS ON WARNING HORNS (THE SHOCKING TRUTH).